Ushahidi means “testimony” in Swahili and this African organisation have built a Web 2 platform that crowdsources crisis information. The platform allows anyone to submit crisis information through text messaging using a mobile phone, email or web form. 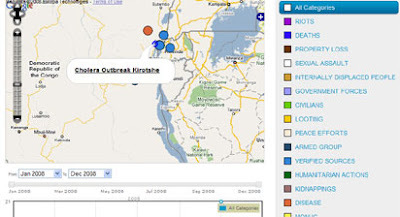 In March Ushahidi produced a map of human rights abuses in Kenya. The mash-up allowed anyone in Kenya to report on human rights violations that they had seen, and then tagged the information on a Google Map. In November they created a similar map for the Democratic Republic of Congo. 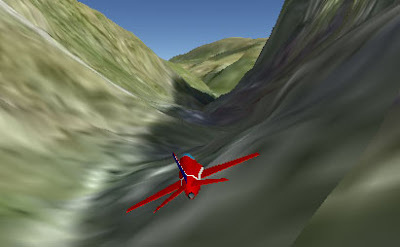 The amazing James Stafford created this flight sim for the new Google Earth Browser plug-in. Put your seat belt on and jet around the world. The Google Maps team unveiled a number of new developments this year but for me the introduction of street view to a number of countries outside of the US was the highlight. In particular the street view imagery of Rome is stunning. The strangest map of the year must have been this Japanese map of smells. Nioibu allows members to map odours that they have encountered.